For A Rabbi Who Worked With The Nazis, Is Judgment 'Unjust'? Claude Lanzmann's documentary profiles a Viennese rabbi put to work in a Czech concentration camp. Although Benjamin Murmelstein was himself not a free man, he was despised by fellow Jewish prisoners. 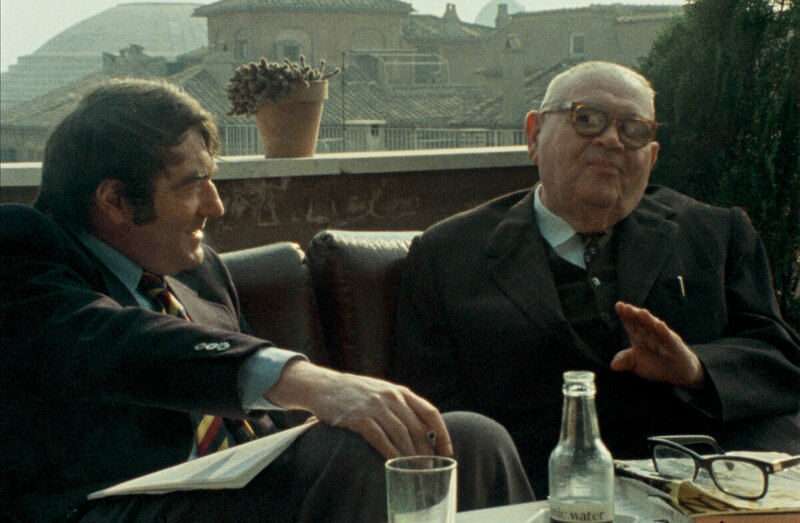 In 1975, Shoah director Claude Lanzmann (left) interviewed Benjmain Murmelstein, the last surviving Elder of the Jews of the Czech Theresienstadt ghetto, at his home in Rome. The resulting film is The Last of the Unjust. Those complexities lie at the heart of The Last of the Unjust, the new documentary by Claude Lanzmann, the prickly Frenchman whose 1985 work Shoah is often called the best film about the Holocaust. But where Shoah is dauntingly austere — its 9 1/2 hours offer no commentary or archival footage — The Last of the Unjust has a vivid immediacy. It centers on one man, the late Benjamin Murmelstein, a Viennese rabbi reviled for his complicity with the Nazis. Lanzmann interviewed him for hours back in 1975, getting the pudgy, bespectacled, hyper-verbal Murmelstein to explain his side of the story. You see, Murmelstein was one of the Jewish elders who helped oversee the Jewish community during the Third Reich. He was a favorite of the clever, corrupt, anti-semitic Adolf Eichmann — Murmelstein scoffs at Hannah Arendt's claim that this war criminal was "banal" — and he eventually became the Jewish leader at Theresienstadt. This was a Czech concentration camp the Nazis dressed up as a model Jewish ghetto for international consumption. In reality, tens of thousands of this camp's residents wound up being murdered, including Murmelstein's two predecessors. Although Murmelstein was himself not a free man, he was despised by his fellow Jewish prisoners. They hated not just his work for the Nazis but what they perceived as his mania for power. He demanded 70-hour work weeks and spruced up the camp to fool foreign visitors. For all this and more, Murmelstein was widely perceived as a collaborator concerned with his own survival. After the war, he lived in ignominious obscurity with some eminent survivors even calling for him to be hanged. I suspect a collaborator is just what Lanzmann expected to find when he tracked him down to Rome and began his interview. Yet from the moment they begin talking, Murmelstein is surprising. Faced with Lanzmann's righteousness and billowing Gauloises smoke, the cunning 70-year-old Murmelstein doesn't flinch. He justifies himself with such irony, cocky verve and memory for detail that we begin to see things from his point of view. His words plunge us into what Primo Levi termed "the gray zone," that ambiguous moral terrain in which a privileged prisoner like Murmelstein is at once a master and a slave. After all, even if Murmelstein did enjoy power, nobody thinks he freely chose to wield it in a concentration camp. He was trapped within the dirty, dehumanizing system the Nazis imposed on millions of victims. Murmelstein argues that he merely played the terrible hand he was dealt. If he forced his fellow Jews to pretend Theresienstadt was a happy ghetto, it was only because this saved lives there. If he ordered them to work 70-hour weeks, it was to keep them from being exterminated. If they worked they might be allowed to survive. What he did wasn't heroic or defiant — the way we'd all like to think we'd be — but it might have been rational, given the circumstances. At different times, Murmelstein compares himself to a tightrope walker, to that great realist, Sancho Panza, and even to Scheherazade, who tells stories to buy time and keep people alive. The most unsettling thing about him is his detached, even bemused tone. He talks about horrors with no obvious emotion, comparing himself to a surgeon who can't afford to be prey to his feelings. Even as this feels slightly inhuman, I find that it makes him more persuasive. He's not selling his pain but his truthfulness. And do we buy it? Like Lanzmann, I believe that Murmelstein believes what he's saying. I also believe that he genuinely thought he was doing the right thing. But was he? Were all those Jewish prisoners who knew him simply wrong to think him a self-aggrandizing villain? Is it possible that, like Alec Guinness' mad colonel in The Bridge on the River Kwai, he got so carried away with keeping order and making the system work that he became a tool of the very thing that enslaved him? The Last of the Unjust doesn't resolve these questions definitively. It can't. At one point, Murmelstein declares that he and his fellow Jewish elders can be condemned but not judged, a line so paradoxical that it could be a zen koan. And this somehow seems fitting. For like so much of what happened in the gray zone, Murmelstein's story remains frustratingly ambiguous. It's a riddle, not an answer.